Step 1. 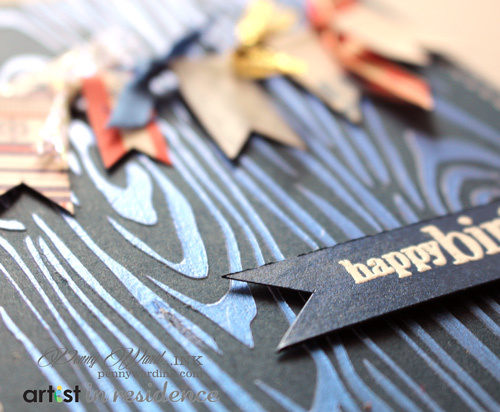 Cut Navy blue cardstock 4.25 x 11 inches, fold in half to make a base card. Step 2. Cut Navy blue cardstock 4 x 5.25 inches. 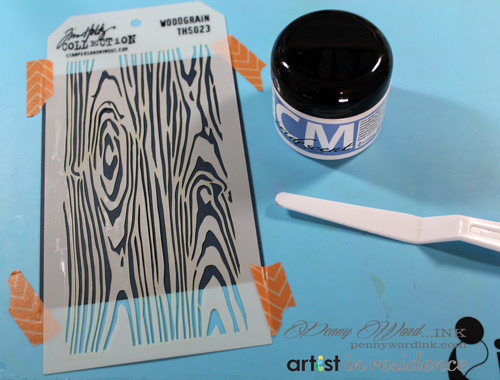 Using low tack tape and a stencil, apply Creative Medium Blue with a palette knife. Let dry. Step 3. Punch half a circle along the top area on each side of card. Make faux stitches with a white gel pen as shown, let dry. Step 4. Add a small length of twine so it drapes from one side to the other of card at the notches. Use scraps of designer paper to make small rectangles. Wrap over twine and notch ends for a fishtail look. Step 5. Tie small knots of ribbon in between designer paper. Stamp and heat emboss sentiment with Versamark ink and White embossing powder. Notch one end and adhere to card front near the bottom.